Our latest proofreading project continues our coverage of the late-19th/early-20th century Frank Tousey Ten Cent Hand Book series, represented by previously-completed projects How to Fence and How to Stuff Birds and Animals as well as by several additional titles still working their way through the process. How to Solve Conundrums sounds like it teaches an extremely useful skill, but in fact its scope is more limited than one might hope. 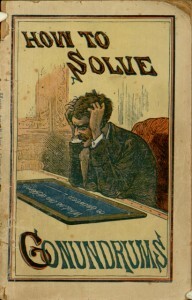 A “conundrum” by this book’s definition is a riddle based on wordplay and punnery, and rather than providing a system for solving such puzzles, the book instead simply lists page after page of them. If you like a bad joke, there are plenty of groans to be found here; if nothing else, it must be said that the cover is memorable!